Logan Hoffman, junior, skis through meet. This picture was taken at the conference meet. With sections coming up this Wednesday, Logan Hoffman, junior, is locked in, and ready to go. Hoffman has been on the hills ever since he was a kid. Hoffman made the right decision to start the sport early. Hoffman has had great success in Nordic this season. 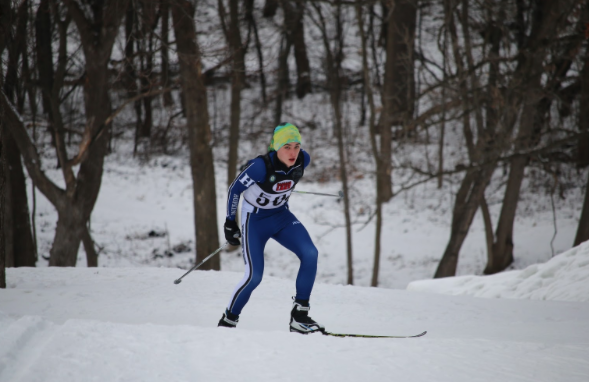 As the season comes to a close, Hoffman and the Royals Nordic team have meshed together as a family. Hoffman and the Nordic Royals team have sections on Wed., Feb. 8, and he has one goal in mind. “This Wednesday is a huge race. I’m hoping that I can advance to state and represent my school at that level, ” Hoffman said.